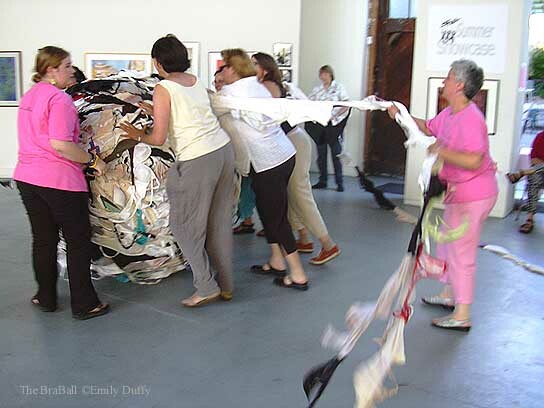 The Final BraBall Roll-On was held on August 24, 2003 at SOMARTS Cultural Center in San Francisco. More than 7,000 bras were added that day, making a new total of 17,103! Also, $500 was raised in support of The Women's Building in San Francisco. 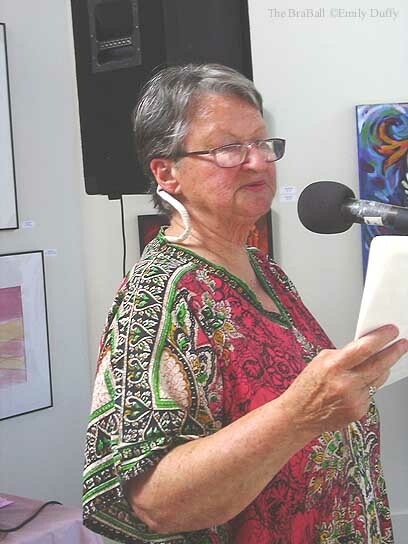 Many thanks to all participants, especially Colleen Oakes and Susan King at The Women's Building. This joyful event never would have succeeded without their support and energy. Here are some pictures and descriptions of the event. 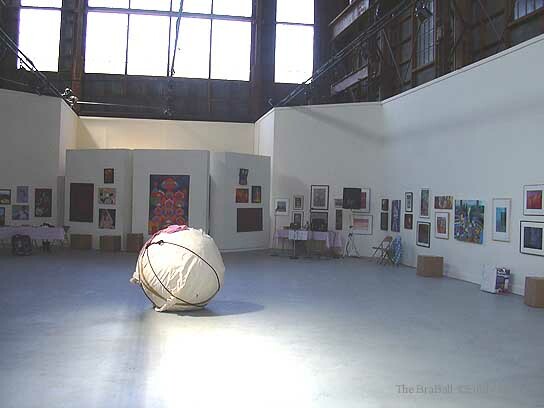 The four-foot tall BraBall is rolled into the middle of the SOMARTS main gallery, (which incidentally had a wonderful exhibit of artwork by the San Francisco Women Artists). 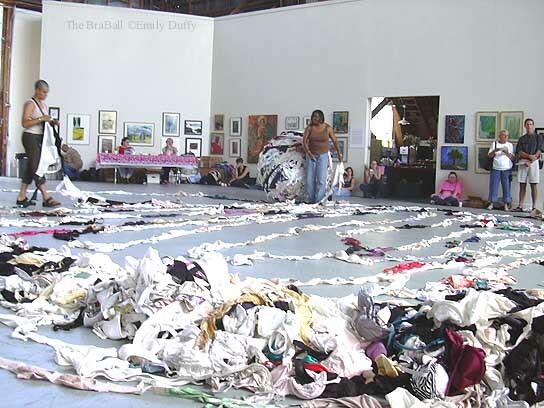 José helps arrange the circular pile of 7,000 bras. 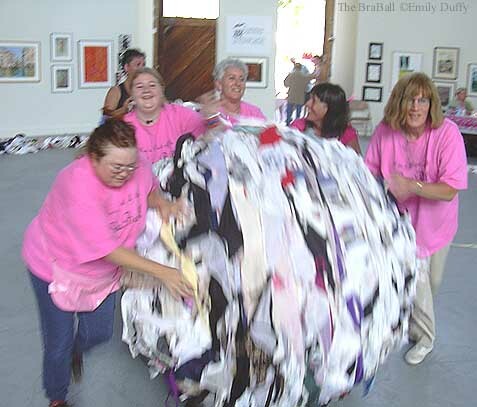 Women begin to roll the final bras onto The BraBall. This went on for seven straight hours! I guess that's about 1,000 bras per hour. At first, it seemed like an unimaginably huge and impossible task. It was also an unusually hot day in San Francisco. Lucky for us, Colleen, Susan, and my friend Robert had arranged for a superbly delicious spread donated by the following generous businesses: Tartine Bakery, Noe Valley Bakery, All About Food Catering, Trader Joe's, and Luna Bar. Participants also brought goodies to share. Of special note were Mary Jo's hilarious and tasty muffins with little faces on them. I have to say I've never seen women work so hard while having such a great time. It was really inspiring and lots of fun, even though we were all sweating buckets. 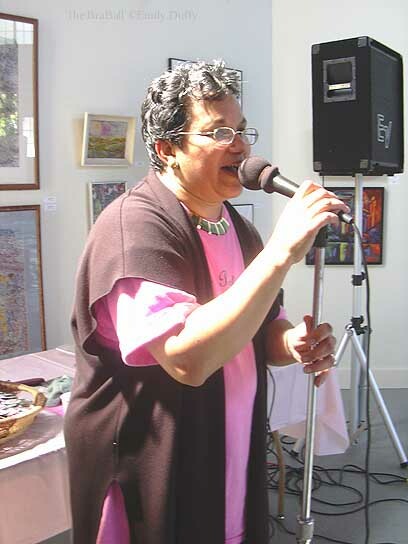 My neighbor and friend Marleen Quint kept the energy flowing all day with her fabulous singing and DJ talents. 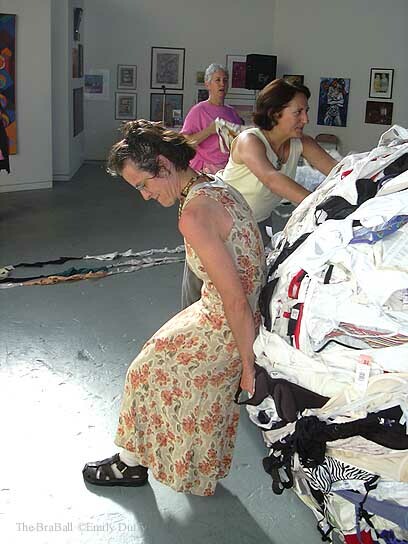 The music, all by women artists, entertained us while lightening our load. 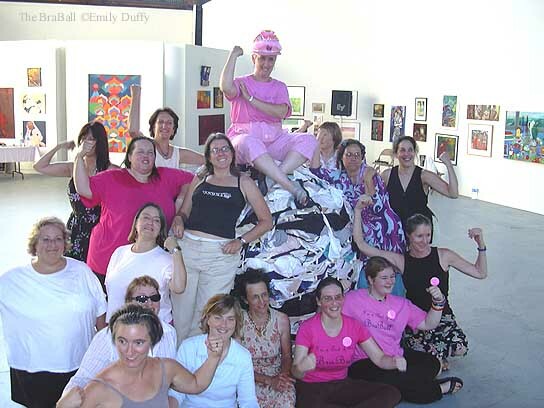 "At Emily Duffy's Final BraBall Roll-On"
Unfasten, woman. Strip it off! The men find a way to help at the men's sewing circle. And the women push the heavy weight around, what a switch! Who says we have no upper-body strength!?! The group listens to Wanna Wright, poet, women's health advocate, and breast and cervical cancer survivor. 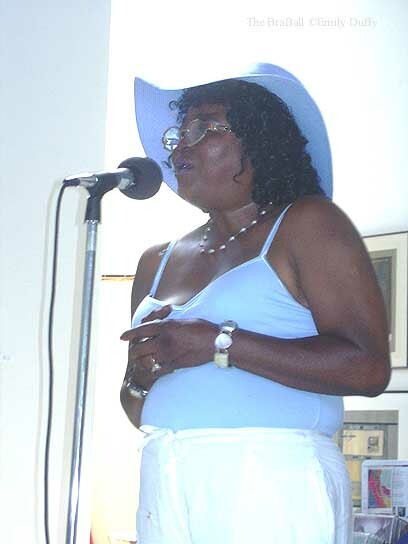 Her poetry was moving and beautiful. 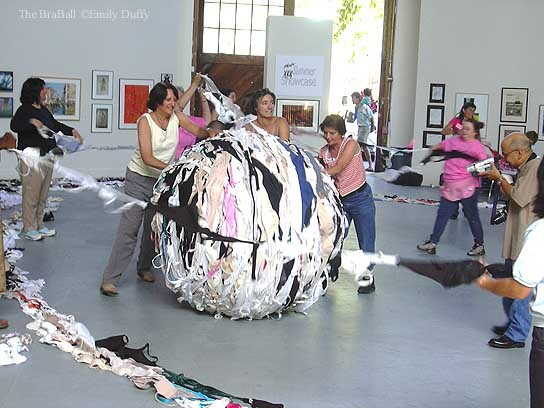 My new sister-in-law, Julie, tries to dig out of the mounds of bras. The BraBall is getting very, very, heavy. But we're having a BALL! 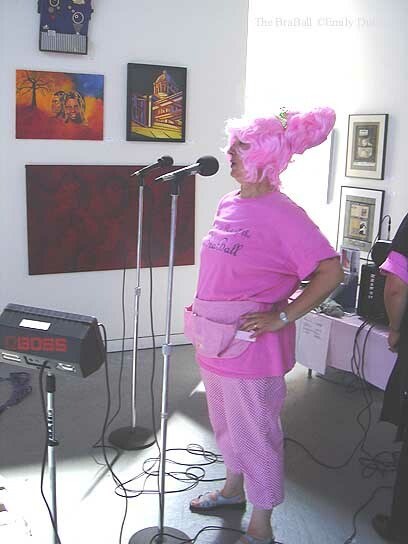 I clown it up in a beehive wig, trying to keep the energy high. 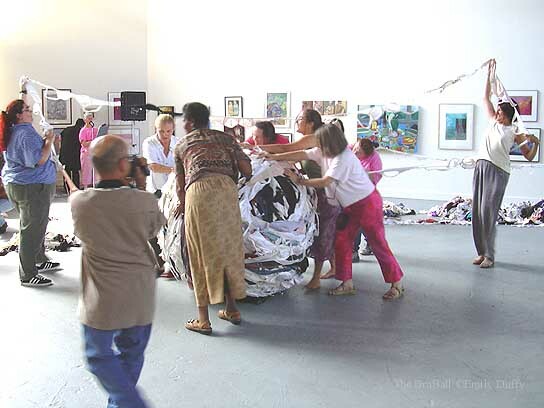 Seems like it's about 95 degrees in the gallery by now, and we're all getting very tired. But we're making remarkable progress. The strands of bras resemble a strange river, or cars on a freeway. The level of participation and energy is truly astonishing. What can I say... Women ROCK! 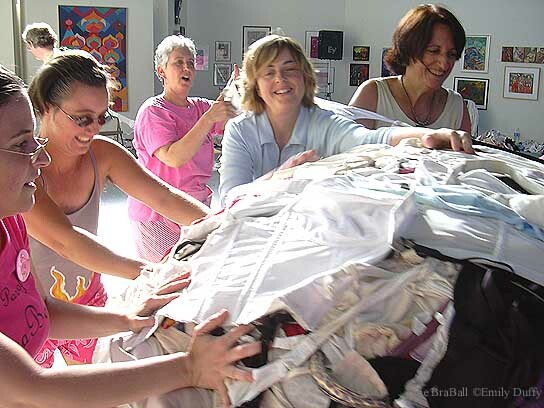 I was pleased that participants found time to sign the "guest book," a big acrylic painting of a bra I did a few years ago. We even found a few bras that the donors signed. I've usually tried to save these for the final outer layer of The BraBall. The level of concentration by the women pushing The BraBall was intense! Finally, FINALLY we reached the end. 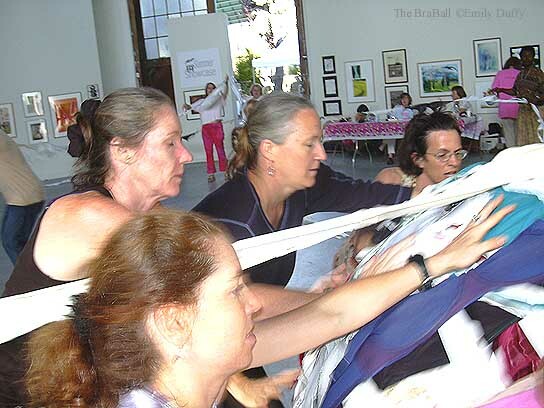 A woman named Barbara had saved the day when she suggested we double-up the strand we were rolling onto the ball. In fact, we tripled it, and that, my friends, is the only way we got it done. The women insisted that I get on top of The BraBall, in my girlie hardhat, for the final photo. Here are the women who were there at the end, proudly showing their muscles. 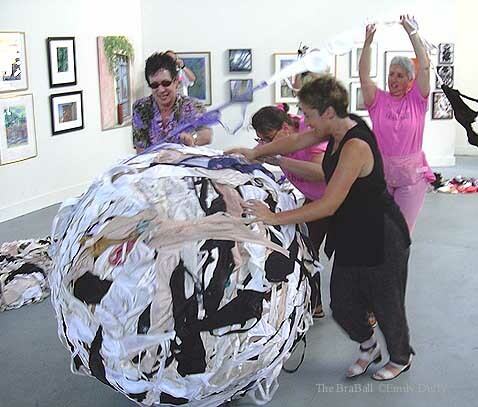 As of November 9, 2003, The BraBall is now FINISHED. None of this remarkable project could have occurred without the help of thousands of amazing women (and some truly enlightened men). Thanks for your "support." I'll keep you posted about future progress through the Updates section of the Website. Photos on this page by Ken Duffy.